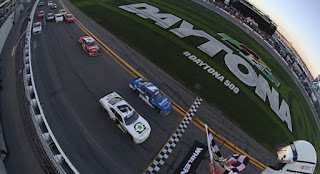 In a day race that ended under the lights, with the closest margin of victory in NASCAR history, Tyler Reddick finished Saturday’s PowerShares QQQ 300 less than three inches ahead of JR Motorsports teammate Elliott Sadler. In the last of five overtimes, after a stoppage of 5 minutes, 27 seconds, and on the 23rd extra lap, Reddick made a move to the outside off Turn 4 and won a drag race with Sadler to the stripe after their cars bumped side-to-side coming to the finish line. The margin of victory was listed officially as .000 seconds because NASCAR timing and scoring doesn’t measure beyond thousandths of a second. Reddick restarted in the lead on Lap 142, after Dylan Lupton cut a tire and nosed hard into the backstretch wall to cause the record 12th caution of the event. Sadler got a run to the inside on the final lap and edged ahead of Reddick, who regained the advantage just before the flag stand. “This feels amazing,” said Reddick, who picked up his second NASCAR Xfinity Series victory in his first start since joining JRM. “This is a hell of a way to start the year off with JR Motorsports. “Ryan Reed and Ryan Truex, those guys were giving me good pushes as I was really struggling on some of those restarts to get going. I was holding back there on the last restart and (Reed) gave me one last really good push to get back up to Elliott. With the victory, the 22-year-old Reddick is all but assured of earning a spot in the NASCAR Xfinity postseason Playoffs. Sadler’s spin on the backstretch on Lap 118 of a scheduled 120, after contact from JR Motorsports teammate Chase Elliott, brought out the eighth caution and started the sequence of events that saw the season opener extended through five overtimes. Though Sadler was disappointed with the runner-up finish, it could have been much worse. The driver of the No. 1 Chevrolet spun twice and drew a black flag for locking bumpers with teammate Chase Elliott and pushing Elliott down the backstretch. Elliott also was penalized as the recipient of the push. “Congratulations to him (Reddick),” Sadler said. “He’s my teammate, so it’s great on one hand to have a JR Motorsports car in Victory Lane, but it’s definitely tough to finish second. I think that’s three seconds in a row for me on superspeedway races, so we’ve got to figure out how to be leading one of these things. “We had a pretty wild day. We spun out twice, got black flagged for something–I’m not real sure what yet. I think I was running 32nd on the first green-white-checkered attempt, and we had a chance to win the race. So perseverance and never give up and just kind of stay after it. That’s the kind of motto of my race team, and it kind of showed again today. The 18-car backstretch wreck on Lap 122 that ended the first overtime eliminated a handful of cars that had run up front all day. The Chevy of Kyle Larson and the Ford of Joey Logano, who combined to lead 89 of the first 121 laps, both were casualties, as was Justin Allgaier, one of the favorites for the series championship. That was just the beginning of the overtime chaos. Third-place finisher Ryan Reed, winner of this race in 2015 and 2017, had the lead for the second overtime restart on Lap 130, but Spencer Gallagher spun off the bumper of Ross Chastain to end the attempt. Ryan Truex inherited the top spot for the third overtime attempt, but surrendered the lead to Reddick, who came within 100 feet of the white flag (and an official race) before the 11th caution forced another try. The fourth attempt was cut short when Lupton slammed the backstretch wall. Behind Reddick, Sadler and Reed, Kaz Grala rolled home in fourth place, followed by Garrett Smithley, who recorded a career-best fifth. Gallagher, Truex, Daniel Suarez, Chastain and Brandon Jones completed the top 10.